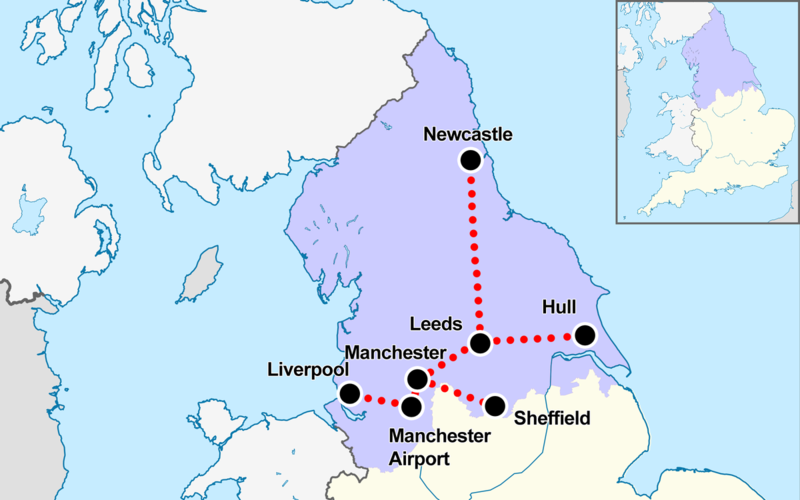 The Northern Powerhouse thrives on being ill-defined. As soon as we try to define it, to tie it down, we enter a rabbit warren of conjecture and counterclaim. The simple binding notion is an evocative one: ambition for the future. That said if there is one clear quality benchmark and potential physical manifestation, it is what has become known as Northern Powerhouse Rail. Formerly HS3. Also known occasionally as Crossrail for the North. It is the signature piece of the Northern Powerhouse project. Nothing else will attract the scale of investment this might, and indeed few other initiatives could have such an evident transformative effect across the North of England and the UK as a whole, while also having such widespread support across the north and across so many different groups. Transport for the North released last week some crucial new analysis on the potential benefits of Northern Powerhouse Rail and configured this across the key cities. It is an impressive piece of work putting some substance and detail to a long-held notion that strong connectivity across the north will unlock the North's potential. Transport is critical for economic growth, as it shapes reach, the proximity of clients, suppliers and staff. It determines where we choose to live so to be within reach of chosen jobs, studies and friends. Improved transport connectivity can have an enormous positive impact across all social groups. The report from TfN shows that for Manchester, NPR could bring 70,000 new business and over a million people within 90 minutes of the city centre. For Sheffield, it could bring around 2.4 million people and 100,000 businesses within 90 minutes. The figures are equally impressive for the other core Northern cities, Leeds, Liverpool, Hull and Newcastle. There is a role for all of us here in championing the importance of this singular and straightforward message. We hear a lot about certainty at the moment. Certainty is a clear currency in the Brexit negotiations and the domestic audience. Arguably though, regardless of the outcome of the Brexit negotiations, the only certainty is that the UK will need excellent infrastructure super-connecting our cities and towns more closely to thrive in the future. We all stand to benefit. The case has been developed and undoubtedly communicated to the Treasury and the DfT through formal and informal channels. These conversations will continue, and the arguments will be interrogated through various looking glasses. The critical point though is that the decision will be made in London by politicians whose view is informed by officials and advisors judging the merits of the case, the competing priorities and a sense of the mood music. We should not expect a swift decision, principally because Brexit continues to crowd out the domestic policy agenda. Despite words to the contrary, the senior parts of this Government are focused on ensuring a Brexit that will work for their domestic political considerations over any other contemporary policy objective.